The prospect of James Keatings and Dylan McGeouch flourishing together in a rampant side wearing green and white has always been on the horizon. Just a year apart in age, the Glasgow-born duo were seen as two of the jewels in the crown of Celtic’s academy as recently as four years ago. Like most young players trying to make their breakthrough at one of Britain’s biggest clubs, however, not everything went to plan. Serious injury interrupted the rise of “golden boy” Keatings at a vital point in his development, while fellow wonderkid McGeouch, who was so highly rated that he was signed from arch rivals Rangers, was simply outnumbered by an array of more experienced players as he battled to establish himself in Celtic’s first team. Since leaving Parkhead in 2013, Keatings, 23, scored double figures in back-to-back promotion-winning seasons with Hamilton Accies and Hearts before arriving at Hibs in the summer. He has already scored seven goals in just eight starts, playing either as an out-and-out striker or as an attacking midfielder. 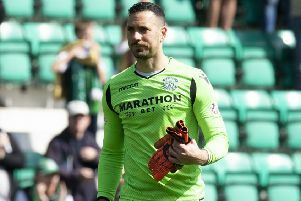 Spence is not surprised to see him prospering at Easter Road, having been convinced that he was destined for a fruitful career from the moment he first teamed up with him in 2009. “I played against him coming up the youths before I got to Celtic and his goal record was incredible,” said Spence. “We had the same agent and on the first day I signed for Celtic 19s, I think he had asked Keats to make sure he looked after me because he had been there for years. He was the first boy to come over and make me feel welcome, which was nice. “It was great to play up front with him because you could tell straight away he was one of the best players in the team. I thought he had a real chance of making it at Celtic. He was highly rated within but then he got a really bad injury that put him out for a year and set him back quite a bit. Keatings has bounced back emphatically since having his Celtic career effectively ended by injury but Spence believes his old mate has so much in-built desire and natural ability that he is only going to get better in the years ahead. “He’s got the ability to change games and he’ll score goals no matter where he is,” he said. “His left foot’s lethal and he’s got a great attitude. I wasn’t surprised to see him banging goals in for Hearts last season even though he was in and out of the team. He’s a confidence player so if he’s got a manager that puts his faith in him, it’ll get the best out of him. That’s what he’s got at the moment with Alan Stubbs. If he gets a good run in the team at Hibs, he’s only going to get better and better. He wasn’t as hyped up as other signings at Hibs but it’s probably been a good thing for him because there’s not been as much pressure on him. Spence, now at Cowdenbeath, was aware of the buzz around Celtic when McGeouch, who is a year younger at 22, returned from Rangers in 2011. Although he didn’t play in the same side as him due to their respective injuries, in the season they spent together Spence saw enough to be convinced that the midfielder, who joined Hibs permanently in August following a spell on loan last season, was cut from the same cloth as Keatings. Although first-team action was ultimately in short supply for Keatings and McGeouch, Spence believes both players will have benefited from their time in the Celtic youth ranks. “Being at Celtic gives you an insight into the lifestyle you can have if you stick in and do well,” he explained. “Once you’ve had a taste of it, that’s something that always stays with you, so even when you leave, you’re constantly working hard to get back to that type of level. The coaching and the set-up, and also the experience of playing with better players also stays with you. “It also puts that winning mentality in you. The whole time I was there, I can barely remember losing a game. You become winners because losing’s not accepted at all at Celtic. With certain boys, when they leave Celtic and go to other clubs, you can see they’ve got that extra mental strength compared to their team-mates. Spence believes that Keatings and McGeouch possess the required motivation to ensure that they are soon back at a level which will have clubs of Celtic’s ilk courting them. “You only get to the fringes of the first team at Celtic if you’ve got a good attitude,” he said. “Some boys will fall away when they leave a big club like Celtic, but it’s boys like Keats and Dylan, who stick with it, who will come back and have a good career. They’re both hungry to succeed.